Happy Victoria Day! The first official long weekend of the summer! The BBQs will be heating up, the coolers are full of beer fun drinks, and the sun is shining. You really can’t ask for anything more. Unless you get to have a reunion of sorts with friends you haven’t seen in about six years. That’s how we spent our weekend. You see, on our wedding day, Hurricane Wilma did some damage to Cancun and our trip to the Mayan Riviera was cancelled. We rebooked to go to St. Maarten and ended up loving every minute of it. We also made some friends, that we are happy to say we are still friends with today. Hence the reunion. M&S live about 10 minutes from our house so we get to hang out with them, but N&A live in La Belle Province. The last time we saw them was in June 2007. So when M&S told us they were coming to visit, we were pretty excited. Dinner on Saturday at M&S’s house, turned into freestyle karaoke. we. Belted out as many 90s dance tunes and rock ballads we could think of, and look up on YouTube. It was fun! Our kids thought we were crazy, I’m sure, but they also enjoyed M do Gangnam Style in her smokin’ hot JLo heels!! Our Little Mouse was doing the moves from her seat. Sunday was dinner at our house, and was a little more subdued. 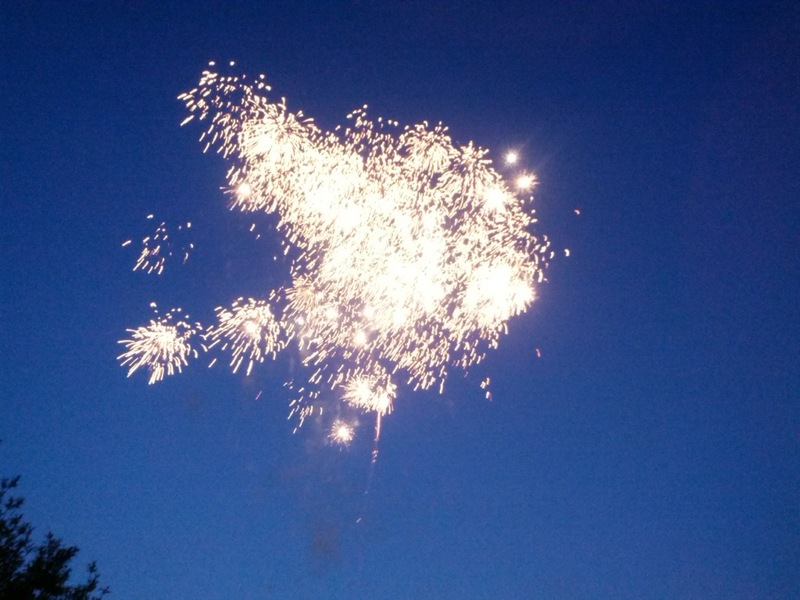 However, shortly after 9:00 p.m., we got to enjoy a little firework display from our back patio. It was impressive for a “driveway” show, so to those neighbours, thanks for buying some nice fireworks, the kids loved it. The Little Bird is still talking about them. The Little Mouse and S may not have been as impressed as the rest of us, as they almost had a little snooze together in the patio chair. So while N&A make their way back home today, and we have a whole lemon Merengue pie to figure out what to so with, I dedicate Beautiful Life by Ace of Base to our St. Maarten friends, and promise not to let six years go by again, until we get together. Besides, the Little Bird is already asking when we can go to Montreal!